Testimonials are curated by Fixes All and are not independently reviewed or verified. "Great idea, I would recommend to everyone, so easy to use!" "Very quick response. System easy to use and understand"
"I like Fixesall because I got a quotation quickly and I know who is coming to my house to do the work." 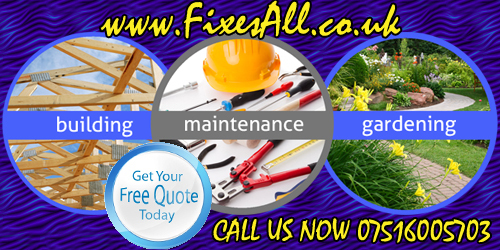 "We use Fixesall for all work we require at home. They have done a brilliant job of so many things. You name it they can do it. No job too large or small. Always do a brilliant job." "The Fixesall System is easy to use and is a great way to organise upcoming jobs."